It's time for another new RetroSketches challenge. The colours are not really for fall, but we have had quite a few cloudy rainy days lately so this sunny cheerful card just felt right. Pop over to RetroSketches today to see what the rest of the Design Team has to inspire you! Yay you, I'm doing catch up on feedly! Congrats on the Retro sketches design team!!!! Such a fun card, I love the sunburst! 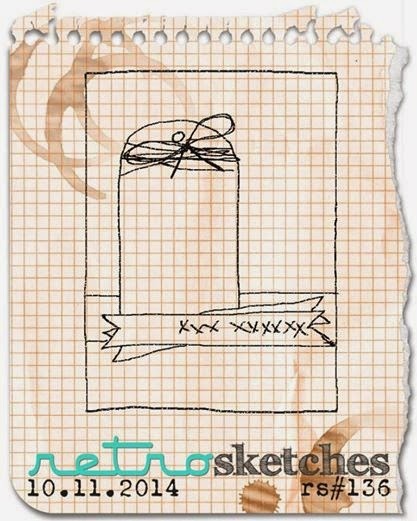 LOve this sketch....and your card! Happy Thanksgiving to you too! Love how you tied the twine on. Great take on the sketch. Oh, Tracey--Love love this sunny card, and fabulous sketch, too. Can't wait to play along. Happy happy Thanksgiving to you and your family. so cute love how you added the tag..
A fabby take on the sketch! Love this sunny card! This is wonderful, Tracey! Happy Thanksgiving! Fun card, Tracey! I never think to use a tag more or less plain & I really like it! Such a fabulous card Tracye...I love that sweet sentiment too. Happy Thanksgiving to you and your family. Such a sweet card, Tracey! 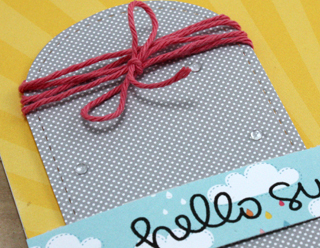 I love how you paired the patterned papers and your sentiment is so cheery! Hope you're having a fun Thanksgiving weekend! This will definitely brighten someone's day! Nothing like a bit of sunshine! Such a cheery card--love it! Hope you had a wonderful Thanksgiving!